Really nice hostel, in the middle of El Nido town so it’s really close to everything! Staff is really nice and flexible and rooms have AC and fans, overall you will get for what you are paying for, although the atmosphere sometimes can be quiet or really funny but that depends on the guests! Sava and Pukka Bar are around the corner if you guys want to keep the party going! Staff are always there when you need them! Quiet hours is are strictly enforced after 1030. Beds are pretty comfortable and decent aircondtioning. Not that much of a social hostel but bars, clubs and restaurants are just right around the corner. Would definitely stay here again! The location is amazing and staff are really friendly. The hostel is clean enough but the triple bunk beds are quite high so be careful if staying on top bunk. Free breakfast included is really good however I think I ate a funny egg one morning served to me and had food poising later on that day. 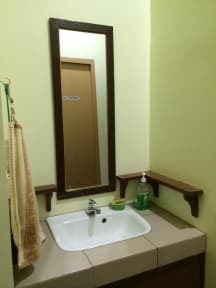 Good value for money as most hostels are super expensive in El Nido. Not a bad place to stay if you want to save some money. 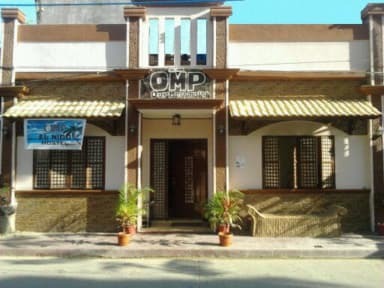 El Nido is pretty expensive and OMP is literally right downtown which makes it perfect if you want to be close to all the action/hit the bars at night. Honestly no complaints, there isn’t much of an atmosphere but if you’re looking for a place with a decent bed it serves its purpose. People in the dorm weren’t very social - Breakfast is included and is very simple (bread and jam sometimes pancakes) but decent overall! No locks on doors tho! It's a budget backpacker place so don't expect a lot. The bathrooms were not great. Low water pressure, but is probably standard in town but they could use a refresh as quite aged. There was a smell in the room I had, could have been another traveler's bag though, who knows. It was sort of musty. No atmosphere really, but location is good, it the town proper. Nothing to rave about, nothing major to complain about. Needs renovation and improvement. On the other side, staff are really great! Pretty average hostel. Location is great (although can be noisy) but the staff isn't particularly welcoming, the common area isn't conducive to socializing and meeting people, and the rooms are caves with no windows and triple bunks. The free breakfast is pretty good, WiFi is useless, cell reception is OK, but overall pretty expensive for what you get (typical in El Nido). I asked for water in the evening, but they were out of clean water so I got so dehydrated. The staff didn’t really care, they did not smile at me once and were super unfriendly. My bed had humid spots on top of it and some kind of fungus growing on it. There was brown stuff smeared on the wall which I don’t want to know what was. During the night you couldn’t really breathe the air got so heavy and humid and the toilets were just disgusting. The overall cleanliness was just unacceptable.